You might have wondered why this series is called the Monday Morning Percolator. Monday is the day most of us start our work week. Morning is when we wake up and coffee is often used to transition from sleep to work. In the age of designer coffee, why an old fashioned percolator and perked coffee when you can have 87,000 different beverage choices from Starbucks? It may seem paradoxical to use an old coffee icon to look at employee engagement – a relatively new term in the workplace. Yet I appreciate how these old coffee percolators slowly made coffee while infiltrating the room with a coffee aroma and a soothing perking sound as the water bubbled to the top of the percolator and flowed down through the waiting coffee. I believe effective engagement is a slow process that goes right to the top of the organization and flows through everyone within an organization. Authentic and engaging percolation helps everyone within an organization gain and gather energy. Some workplace try to ignite engagement with a few perks. These privileges or tangible items given as part of a compensation package are nice but I don’t believe they foster genuine and sustained engagement. I think real perking take time to seep through our daily grind and transform out jobs into engaging work. As the brew continually drips through the grounds, the overall temperature of the liquid approaches boiling point, at which stage the “perking” action (the characteristic spurting sound the pot makes) stops, and the coffee is ready for drinking. 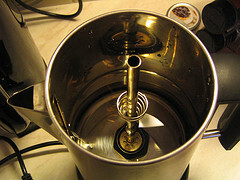 In a manual percolator it is important to remove or reduce the heat at this point, as most coffee-drinkers agree that it should never be allowed to boil; an adage to this effect states, “Coffee boiled is coffee spoiled“. Do you take your time to brew a robust fully engaged organization while ensuring that tasks and emotions don’t boil over? Perk-Ups is the new subtitle for the action section of the Monday Morning Percolator. Much like a push up will strengthen you physically, a perk up will strengthen your mental, emotional, and relationship engagement. Similar to a push up, when you first start they can be hard to do and quite draining but with regular practice you will gather strength as you continue in your training and practice. Take 10 minutes to perk up on Monday morning. Develop and practice a Monday morning routine that helps you let go of the weekend and begin your focus on the work ahead for the week. This routine needs to be short and powerful – don’t let it take any longer than the time it takes to make a great pot of coffee. Your perk-up could be 10 minutes of freewriting about the week ahead. You could connect with two co-workers to hear about their weekend and what their plans are for this week. You could devote 10 minutes of concentrated focus to 1 or 2 pivotal goals you have set for the week ahead. What are you waiting for? Get perking.